Some "Good News" for a change.... please post more, we need it!!! MonroeTalks.com > Categories > News > Some "Good News" for a change.... please post more, we need it!!! Re: Some "Good News" for a change.... please post more, we need it!!! Thanks for sharing this story! I loved it. And, for the record: Anyone who has not had the pleasure of getting caught in a rip current will not truly appreciate how those guys must have struggled while maintaining a wet dog on a surf board. Rips are frightening and worth every ounce of panic that insues. Poor (lucky) little dog. Heeeessssagooboy!! The story made one of the national TV news sites yesterday... I think CNN, but not sure. They stated the man who owned him had a wooden leg and he was in the process of taking it off so he could jump off the pier to get the dog.... sounds like it could have been a tragedy. monroemom1... I've seen a rip tide in Florida on the Atlantic coast.... even just wading into the water, it will just about pull your legs out from under you.... washes the sand right out from under your feet!!! I was swimming at Pacific Beach in San Diego in water up to my chest. Next thing I knew, I was being tossed horizontally in a wave and couldn't find the topside of the water. I could feel the current pulling me out to sea and I was swimming as hard as I could (stupidly, head on into the current). Unable to find air, I opened my eyes in the saltwater to try and find the light only have it burned horribly and all I could see was bubbles. Then, I felt the rushing water pull at my bathingsuit bottoms. Yep, they were going. Talk about panic!! I hooked them on my feet before I lost them. I'm afraid a 1-legged person wouldn't have a chance. Some Good news? Thats not right, the news stations don't believe in such things. It doesn't sell papers, get viewers to tune in. That is the problem, the news media (print, and broadcast) focus on the bad, and not good stories like that one. this one was moving to me though! OK this was brought to my attention and this happened last year at Wisconsin's Red vs. White Game. Be sure to read the description. The video is interesting. Not only does it show her reaction but is shows her with the guys in the band. Interesting is that she kind of resembles Chelsea Bruck. Here is a cool story from Alaska. These guys have a cool story to tell the rest of their lives. 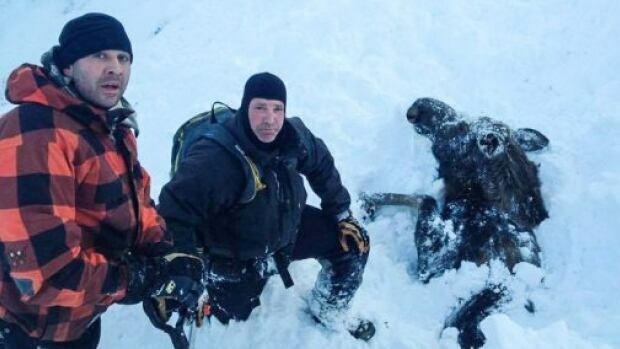 There's an extra moose alive in southcentral Alaska thanks to three snowmobilers who freed it from an avalanche. Marty Mobley, Rob Uphus and Avery Vucinich, residents of the Matanuska-Susitna Borough, on Sunday went riding on the west side of Hatcher Pass about 55 miles northeast of Anchorage, Alaska Dispatch News reported. With Alaska's unseasonably warm weather, they were wary of avalanches, Mobley said. They came upon a hillside that had both moose tracks and ski tracks. The latter stood out because they don't see many skiers in the area. About an hour later, they returned and saw that an avalanche had come down, wiping out the tracks. The three friends were concerned that a skier might have been trapped but also knew more snow might fall. "We had about 2,500 feet of mountain above us still," Mobley said. "Half slid, half didn't, so we didn't want to screw around a bunch there." Mobley spotted something brown moving in the hard-packed snow of the debris field. The men grabbed shovels. Two men dug while the other looked for signs of another avalanche. When the animal's head was cleared, Vucinich took a picture. The moose didn't struggle and appeared calmer as they cleared snow. "It didn't even fight us," Mobley said. "It was like, 'Help me. Help me.' It was totally docile and let us touch it. It just [lay] there," Mobley said. After about 10 minutes, Mobley said, three-quarters of the animal was free. The men were not sure if the moose was injured. One poked the moose's rump with a shovel. The moose was "at full steam" when it ran down the mountain. It appeared to be uninjured, which was a surprise. "In the late 1980s, when he was 12-years old, Martin Pistorius fell into a coma, where he remained in a vegetative state for 12 years. Doctors in South Africa where he lived weren’t sure what caused his illness, but suspect it was cryptococcal meningitis. His condition grew worse and eventually he lost all ability to move and speak and make eye contact with his family. not sure who else is watching or if it was posted elsewhere....but the Rob from Monroe, Michigan..... made it through the first round of Face-Off on the SyFy channel....congratulations to Rob and his family.....there were some really great comments from the judges about Rob's work..... I don't know Rob but it's really nice to see someone do well and be recognized for their talent....my daughter has been watching this show for years and now we really have a reason to watch....keep up the good work!